Miso marinated mushrooms pack a flavour punch, they're really easy to prepare and make for the perfect BBQ canapé or appetiser to start any meal. As the flavour hits their taste buds their eyes widen and a smile comes across their face. The first words I usually get are "Wow, what's in that marinade?" I've had so many people have me dictate it while they type it into their cell phone that I thought it time to include it as a stand alone recipe. So without further ado, here it is and it's so simple! The marinade contains soy sauce and most brands contain gluten. If you're allergic to gluten then substitute with Tamari (equal quantities). Take a glass bowl and add all the ingredients except the mushrooms and use a fork or whisk to blend to an even consistency. This will take you about 5 minutes at most. 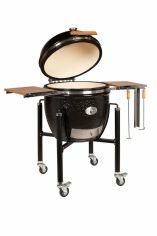 Set your grill up for indirect cooking. You can roast miso marinated mushrooms at pretty much any temperature between 120 - 180°C (250 - 350°F) which makes them supremely versatile and easy to fit in with other food that you are cooking at the same time - clearly the higher the temperature the quicker they cook. I like to do mine at about 150°C for 20 minutes or so. 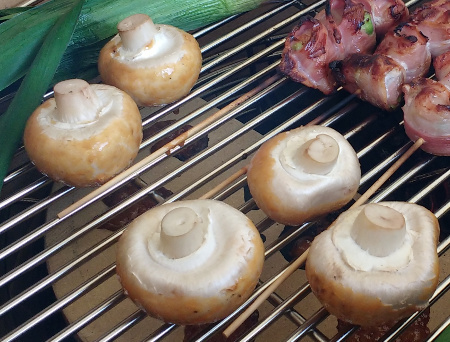 Just hold the mushroom by the stalk and dunk it in the miso marinade and place it on the grill. Close the lid and let them cook. The ones that you see on my Monolith above are fresh on the grill so they still look full of moisture. As they cook, so that moisture will be released and the mushrooms will darken in colour and become flaccid. 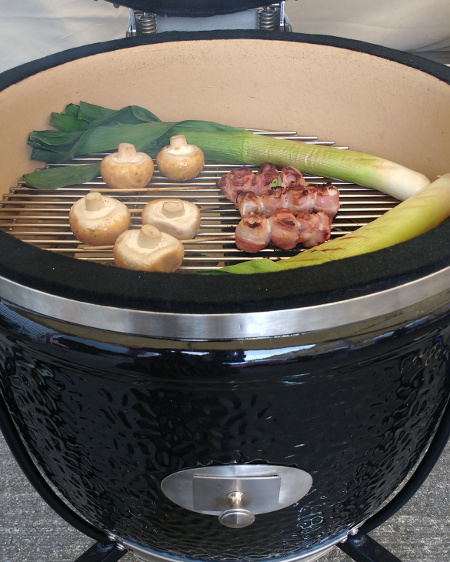 If you look carefully you'll be able to see the heat deflector (half) stone is over the fire so that my miso marinated mushrooms are cooking indirectly while the avocado and bacon skewers and leeks are cooking directly over the coals. Because there's sugar in the marinade you may find that they stick to the grill grate a little so just ease them with a spatula when it's time to serve. In fact the point at which the marinade gets sticky and the mushrooms get soft and wrinkly is actually a good sign that the mushrooms are cooked. I keep service very simple, just on a tray with a cocktail stick. Serve immediately as they're much better when warm.